Our indoor facility is on five acres in a country setting located just five minutes from downtown Tacoma. Canyon Crest Boarding Kennels now offers boarding to any one of your healthy vaccinated dogs. Changing your dog’s diet is not recommended. We ask that you bring your own dog food. Our state of the art kennel design was built by The Mason Company in Leesburg Ohio. 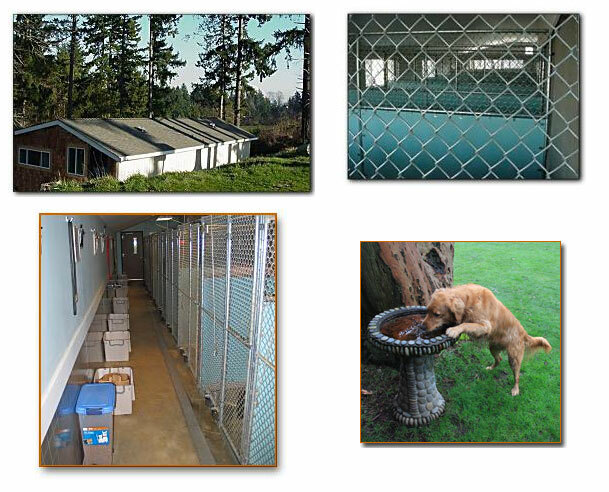 We selected the Mason Company because of their history of building kennels since 1892. The Sani-Kennel System with isolation panel and channel prevents fence fighting and contamination of runs giving them a safe and clean environment. At Ron Pace’s Canyon Crest Boarding Kennels all dog guests are cared for in clean and spacious 5X15 kennel accommodations. Each kennel has a separate bedding area with a heat lamp. Built in stainless steel bowls for your dog’s convenience. You are welcome to bring personal items for your pet’s comfort. To protect your pets, as well as others, all dog guests staying at Canyon Crest must be current on vaccinations. Please consult with your family veterinarian for current vaccination records and bring documentation with you by check-in date. The minimum age accepted as our dog guest is 16 weeks with complete and current vaccines. To avoid potential negative effects of diet changes, the owner is to supply an adequate amount of food during their dogs stay. During hours of operation we do like to have a window time appointment scheduled for drop off and pickup of boarding dogs.